So you may be saying to yourself, “A sports-related Blu-ray review? On Geeks of Doom? What is this madness?! Geeks don’t like sportball!” And you might just be right. But you’re not. In fact many geeks are not only into sports, but can be quite fanatical about them. Being born and raised in New England, it was nearly impossible for me not to be. And so, as you might have imagined, I was extremely excited at the opportunity to review these two new releases celebrating the Boston Red Sox and their recent World Series Championship victory. 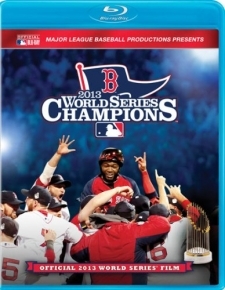 The first release is the MLB Official 2013 World Series Film. The movie, which is narrated by Boston native and Red Sox fan Ben Affleck, begins with a tragedy and ends in triumph. Just a couple of weeks into the season the Boston Marathon bombings happened, and everything changed. When something so devastating occurs, people look for a distraction, something good to latch onto and escape with. The Red Sox were that something.